Organised by the Social Innovation Community (SIC), the most anticipated social innovation event of the year is taking place on the 12-13th November 2018. REGISTER NOW to be part of the celebration! 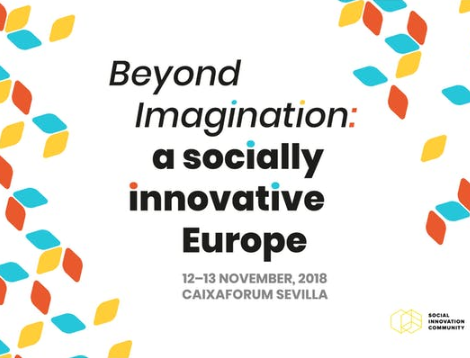 More than 200 leading thinkers and practitioners will gather in the CaixaForum, Seville as SIC hosts an event celebrating the Social Innovation communities of Europe. The SIC Social Innovation Declaration will be launched, and participants will explore how we should learn, invest and collaborate for a socially innovative Europe. A more detailed programme will be available in early September 2018. This event will mark the end of the three-year European Union’s Horizon 2020 project – SIC, by celebrating a Europe where social innovation is growing as a mind-set, adopted as policy and empowered as practice. Register and mark your calendar for 12-13 November. If you have any questions, please get in touch.